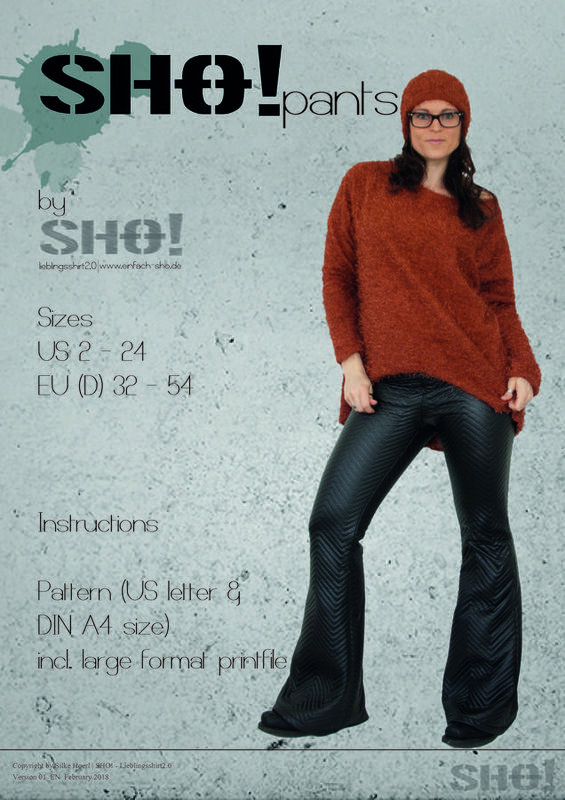 The SHO!pants is a fitted pants with a flare leg. It is tight at the thigh and very flared from the knee downwards. A zipper at the side seam makes it wearable for non-stretch or mimimal stretchy fabrics. Best for this pattern is a fabric with 5% elasthane/spandex., e.g. stretch denim or leather jersey. The amount of stretchiness has a strong influence on the fit and the size, you‘ll have to choose. Please read all infos regarding which size to choose thoroughly. Included in the pattern pieces is a back pocket, which you can add optionally. fabric *2yds - 1in (1,86m) of a fabric with a width of 59in (1,50m) (Size US 24/ EU (D) 54) without a pattern and 2yd - 221/2in of a fabric with a pattern. Up to size 12/42 1yd and 19in is sufficient.